By the 1870's, Canon City became well know regional trade center. Today, Main Street is full of interesting shops, restaurants and museums. 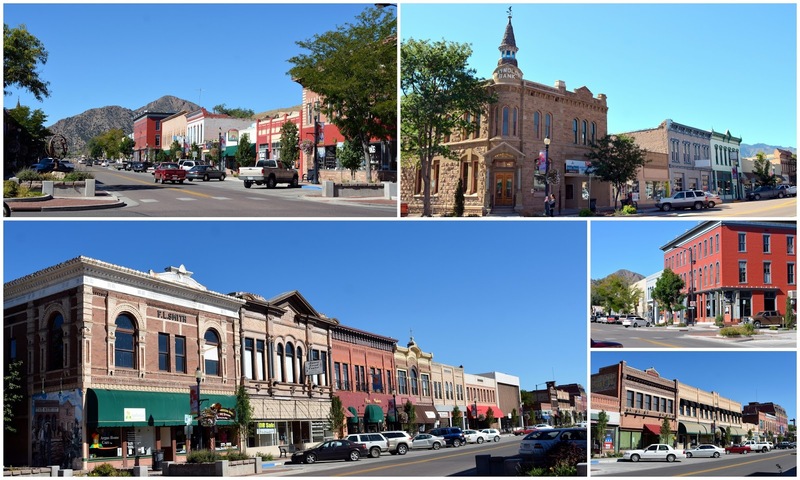 The Canon City Downtown Historic District was placed on the National Register of Historic Places in 1983. It consists of 80 historic buildings, built mainly between 1870 and 1920. I loved looking at the architecture of the well maintained brick buildings and imagining what the town looked like during its early days. A placard along Main Street tells of some of the history of the town and region. 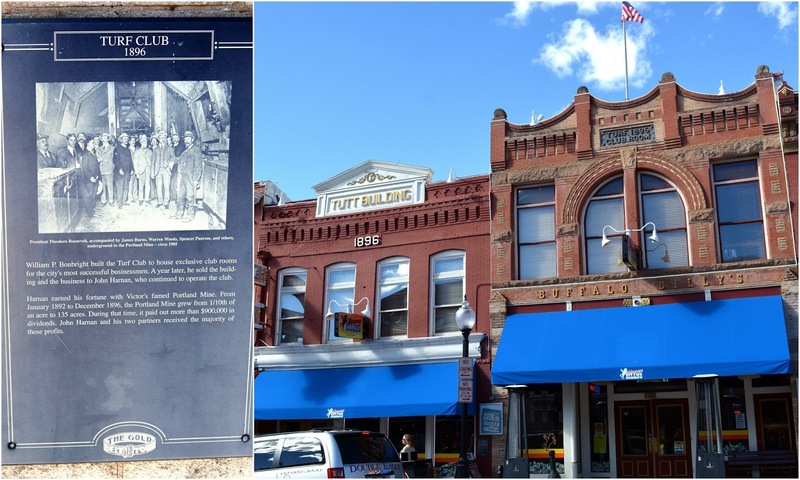 Another placard along Main Street describes how Canon City is also known as the "Banana Belt of Colorado" due to its geography. 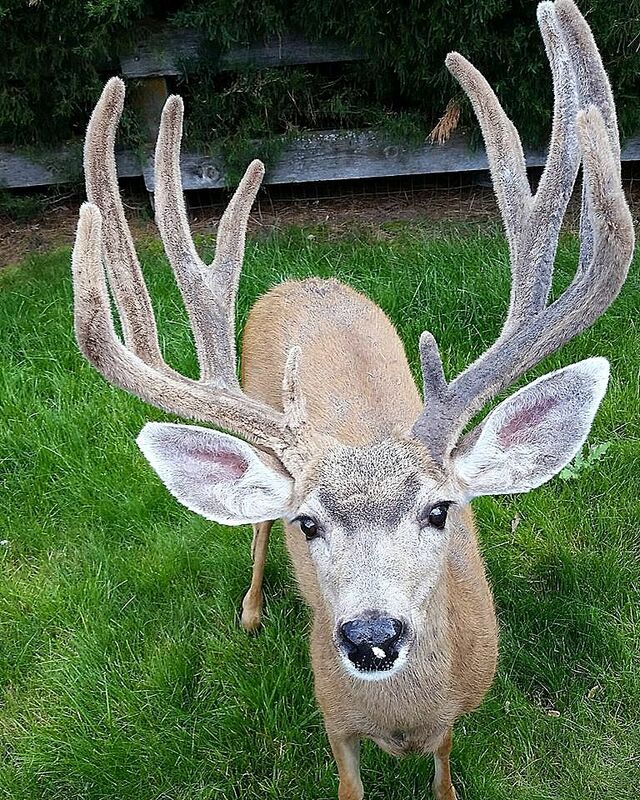 It has a mild climate compared to other regions in Colorado. This enabled early settlers to farm, have orchards and raise livestock. 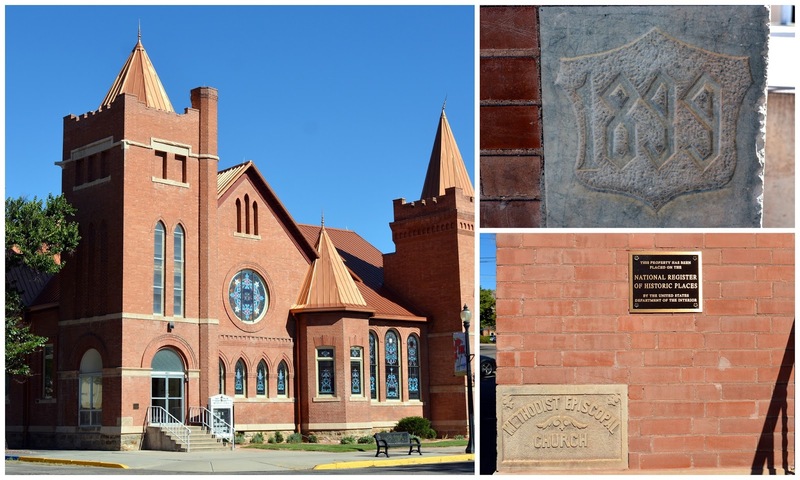 I liked the architecture of the 1899 First United Methodist Church, with its red brick walls and copper tower pinnacles. You can read the church's history on their website at this link. The church was not open on my visit, but the church's website has many photos of inside and of its stained glass windows, as well as its Kimball pipe organ on the church web site under its "history" tab. 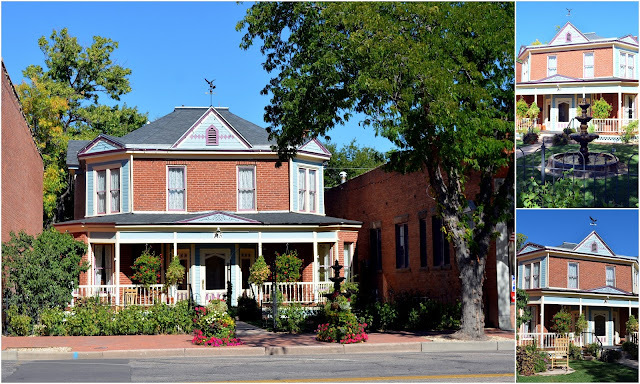 One of my favorite sights was this charming home, that was built in 1888, in the middle of Canon City's Main Street. I believe there is a business located in it now, but I liked how they kept its cozy home appearance. All in all I loved our visit to Canon City and would like to return one day for a longer visit to spend more time in the area. The main reason for our visit to Canon City, however, was to take a ride on the Royal Gorge Route Railroad! The railroad transits the Royal Gorge on a two hour scenic and historic train ride, along the most famed portion of the former Denver and Rio Grande Western Railroad. The train departs the Santa Fe Depot in Canon City daily. My husband and I purchased tickets for a glass domed vista car. The Royal Gorge Route Railroad offers daily departures with several classes of service and dining to chose from, and first class lunch, dinner and murder mystery train rides. 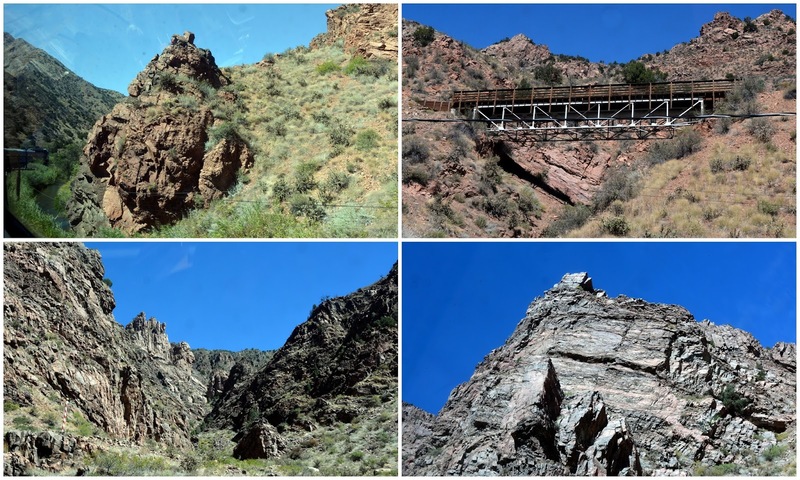 The interesting history of the original Royal Gorge Route Railroad, that began back in 1879, can be read on their website at this link. We had lunch while we traveled west, and enjoyed the views from the domed windows. We planned on going outside to the observation deck car after lunch to enjoy the open air experience and 360 degree views. Notice how close to the canyon walls that the train travels at times! The train ride is fully narrated. We were told that the wires we saw across the canyon are there to signal the train engineer if there were any rock falls from the top of the canyon. If so, the train would stop so they could be removed from the tracks. Our first glimpses of the Royal Gorge Bridge, that traverses the canyon from above was exciting! 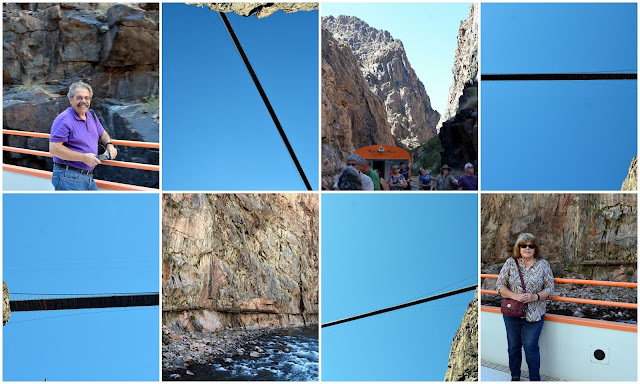 We knew we would be driving to the Royal Gorge Bridge and park to walk across the bridge later in the day. The bridge is 955 feet above the Arkansas River that runs besides the railroad--the highest suspension bridge in the United States, and one of the highest in the world! Built in 1929, the main span of the bridge between the towers is 880 feet (268 m), and the total length is 1,260 feet (384 m). The width is 18 feet, and the towers are 150 feet (46 m) high. The steel base structure is covered with 1292 wooden planks. During our ride west. 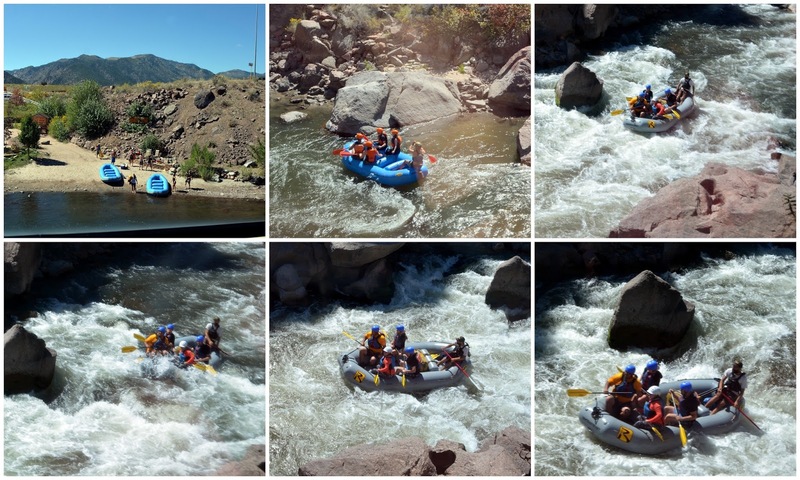 we were also excited to see whitewater river rafters traveling along the side the train! ....and then the train reversed to travel back east towards Canon City. We went to the open air car to stand for the trip back so we could enjoy the views. As the canyon walls grew higher we saw the Royal Gorge Bridge again above us in the distance. You can get an idea of how narrow the canyon becomes at the bridge point. If you click on the photo above you can see people looking down at us from the bridge! The train stops for a few minutes at this point on the return trip to allow people to take photos. My husband and I really enjoyed being outside on the train to see all the views and to take photos of the bridge above. I was able to take this photo above of what was once an attraction of the Royal Gorge Bridge Park. It was a funicular, that was built in 1931, and which brought people down from the Royal Gorge Bridge Park to the bottom of the gorge, where they could stand on the platform to watch the train pass by. The funicular is sadly no longer functioning, due to a fire that occurred in 2013, that damaged the tracks. I was able to capture a photo of both the bridge above and the train below, traveling through the Royal Gorge Canyon. We saw the whitewater rafters again at the end of their trip. I was also excited to get a photo of the "North Pole" of the Royal Gorge. Every Christmas season the Royal Gorge Route Railroad has special "Santa Express Trains" that are very popular events. The train area is decorated with lights and a Santa Workshop. As the children on the train eat cookies and sip hot chocolate, "elves" read them stories. As the train passes the North Pole they can see Santa waving to them. Santa then comes on board to greet all the children and give each child a bell from his reindeers' harness. You can watch a video about the Santa Express Train at this link. We passed remains of old water pipes that once brought water from the river, but are no longer in use. We were approaching Canon City again, and the end of a wonderful train ride. Before we left the train station I asked my husband to take this photo of me standing under a nearby very old cottonwood tree. Look how wide it is! It must be hundreds of years old. We were now on our way to visit the Royal Gorge Bridge and Park--see my next blog post to see more! Cripple Creek Colorado, the World's Greatest Gold Camp! This was our first view of the high 9,494 foot valley of Cripple Creek, Colorado, called the "World's Greatest Gold Camp." In 1890, a local rancher, Robert Miller Womack, discovered a rich gold ore on his land, and the last great Colorado gold rush began. Thousands of prospectors flocked to the region and in three years the population increased from five hundred to ten thousand. At its peak in 1900 over 500 mines dotted the area, and in 71 years of operation 21 million ounces of gold were produced--more gold than the gold rushes in California and Alaska! In my last blog post--click here to read--I showed you a town at the eastern foot of Pikes Peak, called Manitou Springs. 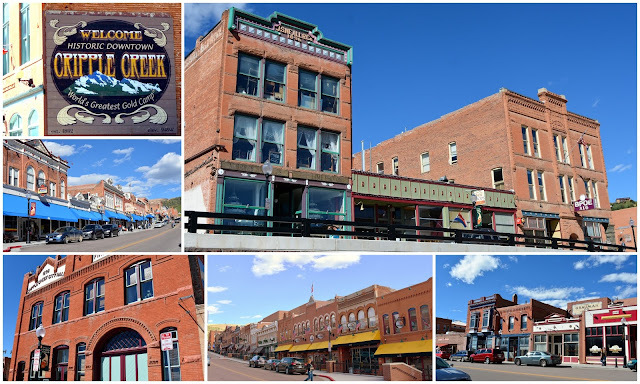 Cripple Creek lies on the western face of Pikes Peak, and is a forty five minute drive from Colorado Springs. A placard at the Heritage Center overlook shows the locations of many of the famous gold mines in the area of Cripple Creek. 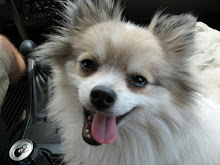 One can also drive a 131 mile Colorado Scenic Byway Gold Belt Tour in this area. Four wheel drive is required in certain parts of the byway which is unpaved. 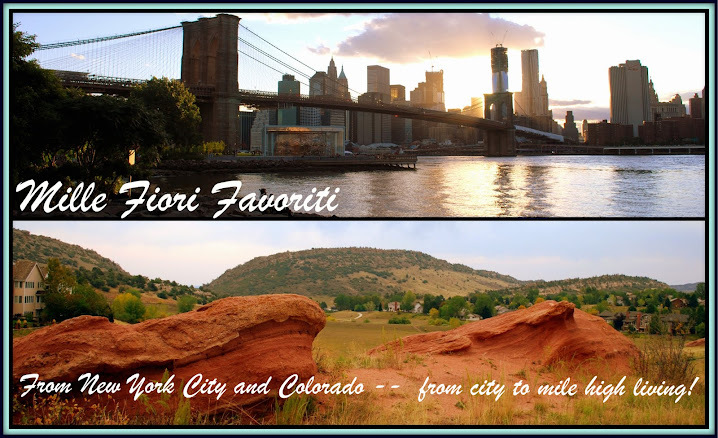 The Florissant Fossil Beds National Monument, can be accessed from the byway, where there are some of the richest and most diverse prehistoric fossil deposits in the world, such as those of an ancient red wood forest, insects and plants. This placard shows "Poverty Gulch" area where Womack made the first gold discovery. 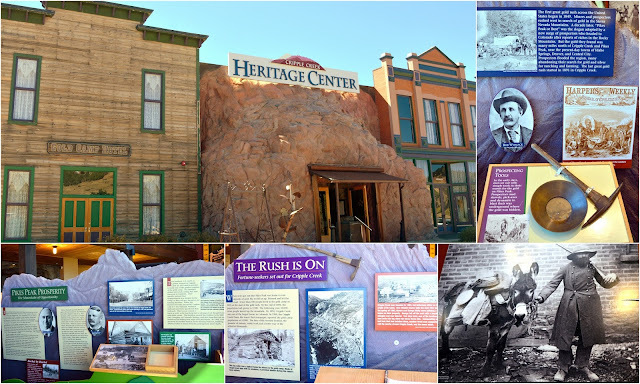 The free Cripple Creek Heritage Center, located at 9283 South Highway 67, is worth a visit, as it is full of fascinating exhibits about the Cripple Creek area's Gold Rush era, as well as information about the region's rich geologic and prehistoric history, the Native Americans who lived here, and recreational opportunities in the area. I loved seeing the displays of vintage photographs from the early mining era. 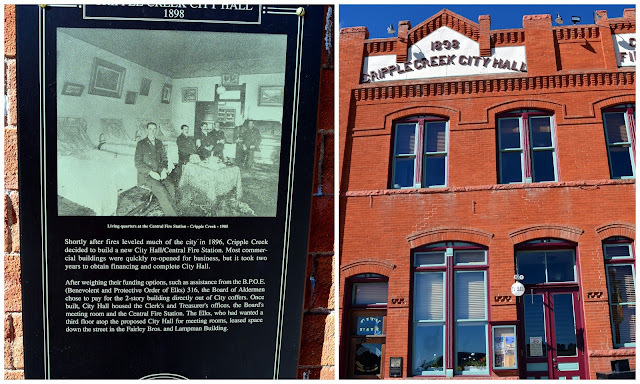 After the Gold Rush era ended and production in the mines almost completely ended, Cripple Creek's population slowly dwindled until it was basically a ghost town. 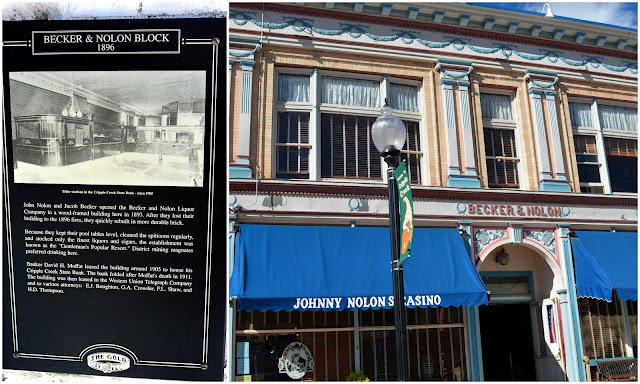 In 1991, Colorado voters allowed Cripple Creek to establish legalized gambling and many of the vacant historic buildings became casinos. The casinos have been successful in bringing back tourists and revenue to the area. We were surprised and thrilled to see one of the wild donkeys in the area walking down the main street during our visit to the town! The donkeys are believed to be made up of several direct descendants of the donkeys that were used to work the mines in the Cripple Creek and Victor mining district in the early years of the gold camp. When miners left the area they often left their donkeys behind, free to roam. Volunteers help to take care of the donkeys and a big event every year is a fundraiser called Donkey Derby Day. 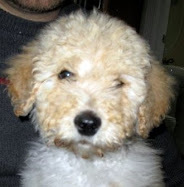 There are attractions in and around the town, and we know we will have to return one day to partake in more of them. The Mollie Kathleen Mine has the world's only 1,000 foot vertical gold mine tour. 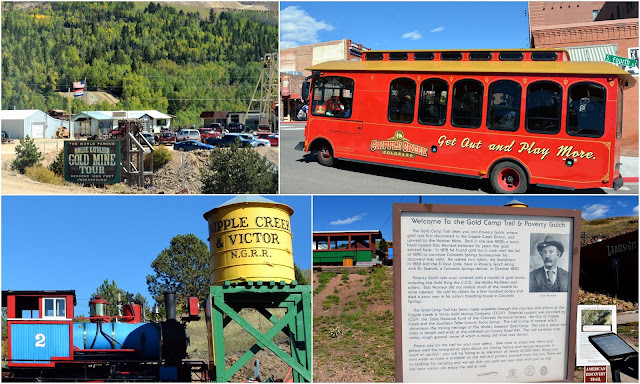 One can ride the Cripple Creek and Victor Narrow Gage Railroad, a narrated four mile forty five minute steam engine railroad trip past many historic mines and beautiful scenery, or hike one of the many trails in the area, or take a free shuttle bus ride from casino to casino in the town. ...reading the stories about the historic buildings pasts. Click on each photo collage to enlarge them to read about them. 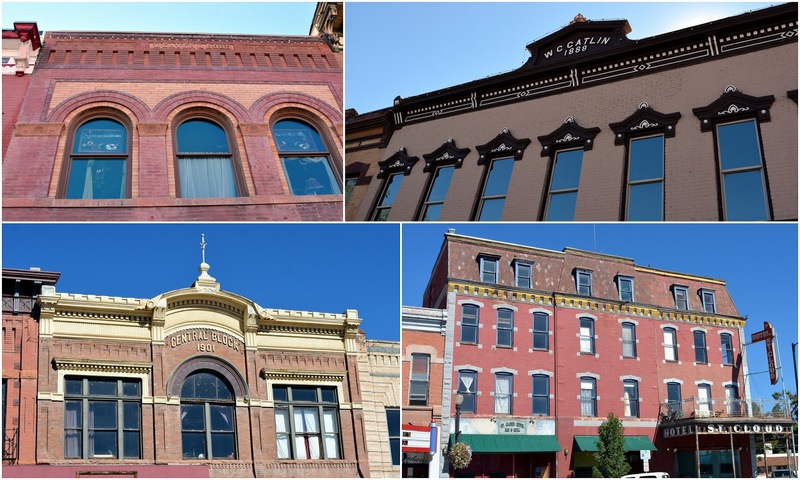 These were just a few of the historic buildings in Cripple Creek. 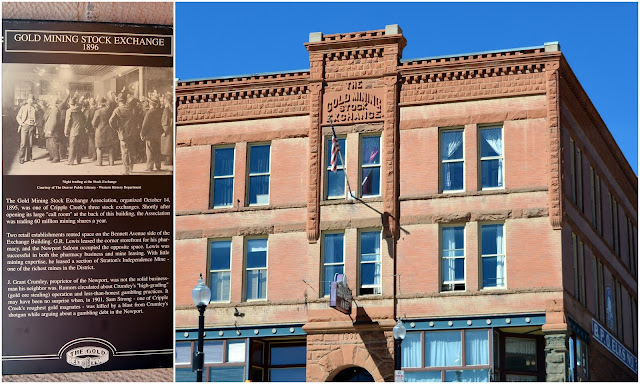 After having lunch in a cafe, we continued on to our next destination, happy to have had a visit to Cripple Creek and to learn of its interesting history. ....and the beginnings of autumnal tree colors, in September of last year. 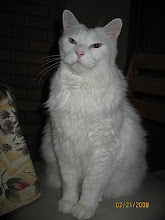 We were on our way to Canon City to take a ride on the Royal Gorge Railroad...come back next post to see more.